Dario Moreno was born in 1921 in Izmir to a Turkish father and a Mexican mother. It is said that he acquired his love of song at an early age, while singing at synagogue. Though he travelled the world, becoming a famous composer conversant in eight languages, he retained his Turkish citizenship and his love of Turkey throughout his life. Today the main pedestrianized thoroughfare to the Asansor bears his name. 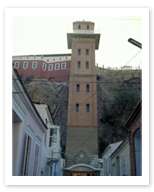 The Asansor itself is an elevator built in the 19th century and still functioning. Hop on and it will take you from the lower to the upper streets, traversing 51 meters (160 feet) to do so. Once at the top, enjoy the beautiful view and perhaps stop for a bite at the restaurant there. You may even notice a song by the city’s favorite musical son sweetly playing in the background.